Amsterdam, the Netherlands – Royal Philips Electronics (NYSE:PHG, AEX:PHI) announced that today’s Annual General Meeting of Shareholders (AGM) has approved the appointment of Ms. Neelam Dhawan as a member of Philips’ Supervisory Board and the re-appointment of Mr. Ewald Kist, effective upon the closing of the 2012 General Meeting of Shareholders (AGM) on April 26th, 2012. As per the same date, Mr. John Thompson has retired from Philips’ Supervisory Board, with Mr. Jim Schiro succeeding him as Vice-Chairman of the Supervisory Board. Mr. Jackson Tai has succeeded Mr. Kist as Chairman of the Audit Committee and Mr. Kist is now a member of the Remuneration Committee. The General Meeting of Shareholders also approved Philips’ proposal to pay an annual dividend over 2011 of EUR 0.75 per share in 2012. This dividend will be paid in cash or shares, at the shareholder’s option. More information about the optional dividend can be found here. All other proposals made to shareholders at the AGM were also accepted. 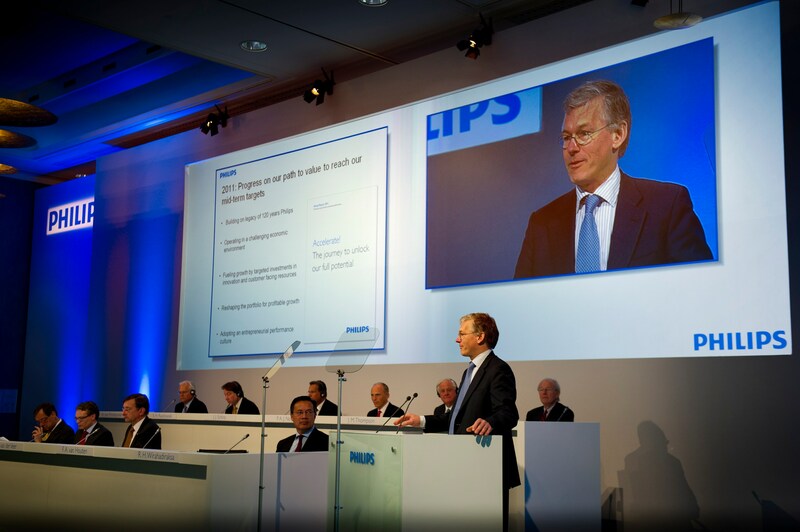 For more information about Philips’ 2012 AGM, please visit this site. Additional information on the composition of the Board of Management, the Executive Committee, the Supervisory Board, as well as Philips&apos; 2011 results, is included in Philips&apos; 2011 Annual Report that was published on February 23, 2012. Read more about the speech from Frans van Houten, CEO Philips. Philips CEO Frans van Houten speaking at Annual General Meeting of Shareholders in Amsterdam about the company’s mission to make the world healthier and more sustainable through innovation.